For kids and collectors we produce a few different styles, some traditional but most are designs unique to our studio. We categorize them in two ways: production and one-of-a-kind. All marbles are wonderful on their own or as part of a collection!. 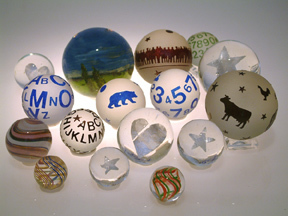 This group includes Cameo, Isinglass, Latticino and Hand-Painted Marbles.